Daimler, the parent company to Mercedes-Benz, builds the cars in Hambach, France. SmartUSA, a division of Penske Corp., is the U.S. importer. The cars run on gasoline and get about 37 mpg. 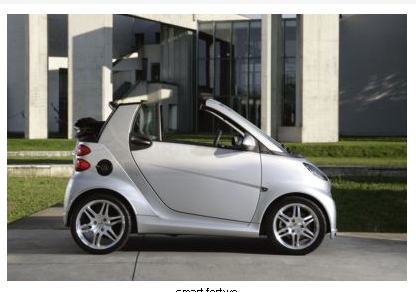 They cost around $12,000 for a stripped model or $17,000 for a loaded convertible. Higginbotham Mercedes-Porsche in Jackson will be the local distributor for the cars and should be available by summer. Kumho Tires, based in South Korea, has the smell-good auto tire market to itself. The heat-resistant scented oils in the tires also make the inside and outside of your car smell better while driving - and your garage smell better when you're not. You can order them at Discount Tire or Sears for around $120. If you were looking for an excuse to buy a Mustang convertible...it's for a good cause. The limited edition 2008 V-6 Mustang with Warriors in Pink Package is adding more muscle than ever to the fight against breast cancer. In celebration of Komen’s 25th Anniversary, $250 from the sale of each package will go directly to Susan G. Komen for the Cure®. Pink tape striping and pink stitching on the leather seats. Mustang pony badging over pink breast cancer awareness ribbon. For the first time in the history of the LATE SHOW with DAVID LETTERMAN, when visited by the 12 drivers that made the cut for the Chase for the Nextel Cup, there was a Top Twelve instead of a Top Ten. 12. Clint Bowyer: “We’ve got special mirrors that show objects the size that they actually are. Pringles has partnered with Nascar racer Jimmie Johnson to launch the Pringles VIP Race Weekend Sweepstakes. The promo will give away a trip for four to the Ford Championship Weekend at Homestead-Miami Speedway and an all-expenses-paid, three-day/two-night trip to the Ford Championship Weekend in November - with $500 spending cash too. The winner also gets to meet Jimmie Johnson as he prepares to defend his 2006 Nextel Cup title. Let Homer throw your insults at other drivers for you. Use the touch-button feature or opt for motion activated. Sticars is a new line of magnetic art - for your car. Choose from a variety of patterns - both tough and girly - from flowers to skulls. On Sunday, when NASCAR NEXTEL Cup racing returned to ESPN with the Allstate 400 at the Brickyard, a technical innovation developed by ESPN and SportVision let NASCAR fans "see the air" too with Draft Track, a special effects package that shows airflow created by NASCAR race cars. The new effect will initially be used on replays only. Draft Track was created by ESPN in collaboration with SportVision. Using computational fluid dynamics information and wind tunnel data, SportVision developed a comprehensive model of the airflow as it affects cars in relation to each other. The system uses positioning data derived from SportVision’s patented RACEf/x system and the Draft Track computers calculate and determine the profile of the airflow many times per second on cars traveling at more than 200 mph. Once the calculations are done, the airflow effect is then locked to the highlighted cars using SportVision optical tracking technology, and a visual representation of the airflow is inserted into the video that ESPN viewers see. The density, color and velocity of the airflow help illustrate the effects of drafting on car performance, and the effects vary with the behavior of the airflow. See a video of what it looks like here. The Indianapolis race was ESPN’s first NASCAR Cup race since 2000, but the network covered 262 Cup races during a 20-year period starting in 1981. ESPN and ABC will have live coverage of the final 17 races of the NASCAR NEXTEL Cup season, including all 10 races in the Chase for the NASCAR NEXTEL Cup on ABC. In addition, ESPN2 is the home of the NASCAR Busch Series all season, and its races are being televised with the same standards of production and effects that will be used in the Cup Series. What's the cost of the average racing shock absorber? At least $750, from suppliers such as Penske Racing Shocks. The inside story: "These absorbers are like a piece of jewelry," Wallace says. "They're spun on a lathe and get anodized with a hard coating to make them more durable." How many times is a race car washed on a race weekend? At least four, according to Matt Kenseth's No. 17 DeWalt Ford Fusion team. The inside story: "Too much debris could affect a car's performance," Wallace says. Nearly all drivers stay in motorcoaches at the track. How many miles does the motorcoach driver log each year? Tens of thousands. Scott Glasgo, the motorcoach driver for J.J. Yeley, who steers the No. 18 Interstate Batteries Chevrolet, drove more than 36,000 miles in 2006 as Yeley ran both the full Nextel Cup and Busch schedules. The inside story: "If this is your job, you're going to have to love to travel," Wallace says. "After Sunday's race, you drive straight through to be at the next track by Monday night. It's not such a bad schedule. On Tuesday, you'll need to wash the motorcoach from top to bottom. But then you get much of the rest of the week off." How much of the race-day winnings do drivers actually take to the bank? The inside story: "A person at Dale Jr.'s level is going to negotiate for 50% of that check," Wallace says. "The owner gets a big share, and you pay bonuses to the crew. Then, most drivers are in the 40% tax bracket. So, by doing the math: A $500,000 payoff -- which is extremely high -- is reduced to at least $250,000. Then take a 40% tax cut out, and you have $150,000, or less than a third of $500,000. But these guys aren't going to need a second job. They also get a team salary, and a top driver will make about $3.5 million, in addition to race winnings." How many tires does a team go through in one race? Between 12 to 20 sets. The inside story: "It depends on the track, but, sure, you can go through that -- especially at an old track like Darlington," Wallace says. "The surface there can get so abrasive that if you run your hand along it, it will feel like sandpaper. As soon as you start the race, you'll feel the tires wearing down." How many people does it take to support each driver on a race weekend? 24. At least that's what it takes for Kenseth's team. The inside story: "We shouldn't need all of those people, but teams these days are so specialized," Wallace says. "You'll have a race spotter, an engineer, a crew chief and a scorer at the track. Then there are the garage and pit guys. Once, the guy who'd toss your used tire also put gas in the tank. Now, you'll have a guy lift weights and train all week specifically just to throw the used tire from the pit. And then another guy trains to put gas in the car. Everything is so choreographed these days. It used to be that a typical pit stop took 18 to 20 seconds. Now, the teams are demanding 12 seconds, because each second on a pit stop translates to 15 to 20 car lengths lost on the track. These guys will make $75,000 to $100,000 a year, too." Who needs cute on the dashboard? This 3-1/2" tall, hard vinyl dashboard ornament features two of these elusive and deadly assassins engaged in a dramatic battle. 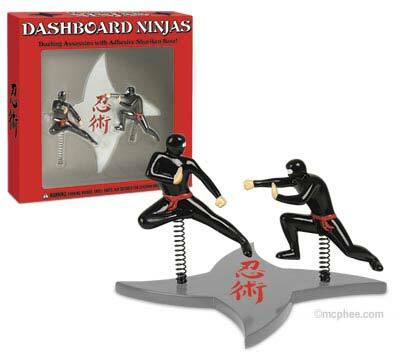 Each ninja is attached by a metal spring to a 5-1/2" wide, hard vinyl throwing star base with adhesive on the bottom.